Macy's, Fall Lipstick — Denv.Her. Pucker & pout denv.her. babes because Macy's is at the ready with all your fall lipstick needs! Whether it's MAC's tried and true Ruby Woo, Urban Decay's Vice line or the newest Dior Addict Lip Glow, Macy's has the beauty market's #BEST lip choices to help update your fall lipstick collection! denv.her. 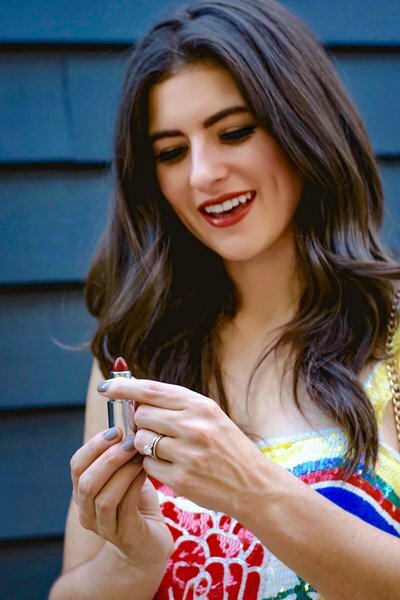 's personal favorite Macy's lipstick shades for fall 2018? Clarins Joli Rouge Velvet, Spicy Cinnamon & Estée Lauder Pure Color Envy Sculpting Lipstick Tumultuous Pink. When looking for smooth lips, remember to always exfoliate first before applying any primer or color. To give the look of a fuller pout, apply gloss in the center of your bottom lip. To ensure color throughout the entire day, use lip liner to fill in entire lip before applying your perfect shade. Don't be scared to ask for a Macy's beauty expert's help while in the store! Not only can they assist you with finding the fall shades you need, they can also recommend lip exfoliating products, gloss and lip liners that will pair well with your chosen lipsticks. See below for product links and happy shopping denv.her. babes!